Southern University New Orleans Chancellor Victor Ukpolo, Ph.D, has announced his resignation effective June 30, 2016, after serving 10 years in the position. After he steps down, Ukpolo plans to return to the classroom to teach at SUNO before eventually returning to Nigeria as the patriarch of his family. “It is my hope that I still have some productive years to give back to my homeland,” he said. He was appointed chancellor on Jan. 6, 2006. He led SUNO during a critical time in the University’s history, rebuilding the campus that was submerged in flood waters after Hurricanes Katrina and Rita. During his tenure, the University built its first-ever housing complex, an Information Technology Center, a new College of Business & Public Administration Building, and a Small Business Incubator on the newly developed Lake Campus. Ukpolo also oversaw the renovations of the University Center, the Leonard S. Washington Memorial Library and the first floor of the Bashful Administration Building. In addition, four new buildings are slated to be constructed: the Education Building, the Natural Sciences Building, the Arts, Humanities and Social Sciences Building, and the Millie M. Charles School of Social Work. The University broke ground on the new Social Work building in November 2015. 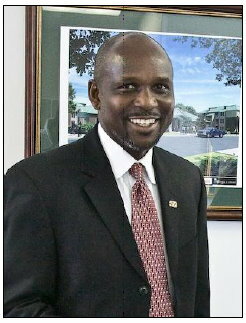 SUNO experienced impressive student population growth under Dr. Ukpolo’s leadership. Immediately after Hurricane Katrina, he launched an aggressive marketing and reorganization campaign, which included the introduction of four innovative online programs to attract displaced students. Despite projections that only 1,200 to 1,500 of the 3,600 students enrolled before the storm would return, more than 2,100 students came back to continue their education on the new Lake Campus in trailers supplied the Federal Emergency Management Agency (FEMA) and the U.S. Army Corps of Engineers. With enrollment climbing faster than any other four-year institution in Louisiana, SUNO not only moved back to its original location, known as the Park Campus, in the winter of 2008, but is also experienced unprecedented growth. Looking toward future generations, Dr. Ukpolo established an innovative dual enrollment program to allow qualified high school students to earn college credits at the University. He also continues to support the Honoré Center for Undergraduate Achievement, created to reverse the trend of fewer African American males graduating from college, while increasing the number of male-certified classroom teachers in urban settings. Programs such as these demonstrate Dr. Ukpolo’s care, commitment and concern for SUNO’s students, many who, like him, are the first in their families to attend college. Ukpolo, formerly the Southern University System’s Vice President for Academic and Student Affairs, previously served as Associate Vice President for Academic Affairs at California State University in Los Angeles. He also served as Associate Vice Chancellor for Academic Affairs/Special Assistant to the Chancellor for Academic Research for the Tennessee Board of Regents. He started his career as an Assistant Professor of Economics at Austin Peay State University, where he also held an administrative post as Executive Assistant to the President.